The passenger compartment remained stable during the impact. The front seat occupants were sufficiently well restrained by the double seatbelt pretensioners that their knees did not contact the facia. Opel showed that the knees and femurs of occupants of different sizes and those sat in different seating positions would also be well protected. The Insignia scored maximum points in the car side impact test. In the pole side impact, protection of the chest was adequate and of all other body regions was good. The reactive head restraint provided good whiplash protection. 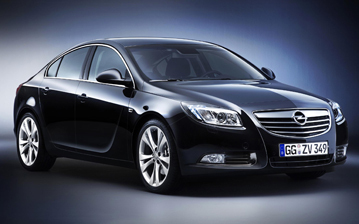 Based on dummy data from the crash tests, the Insignia scored maximum points for protection of the 3 year infant. However, points were lost for the non-permanent label which did not adequately warn of the dangers of using a rearward-facing child restraint in the front passenger seat. The passenger's airbag can be disabled by means of a switch but information given to the driver about the status of the airbag is not sufficiently clear. The presence of ISOFIX anchorages in the rear seats was not clearly marked. The bumper scored maximum points for protection of pedestrians' legs. However, the bonnet was rated as predominantly poor for the protection it offered the head of a struck adult. Electronic Stability Control is standard equipment on all of the Insignia model range. Both front seats have a seatbelt reminder system which met Euro NCAP's requirements.